- uncover forgotten knowledge to be free and consume the world! - be aware, characters can follow clues your manipulation will let behind and world can be aware of you rising! Any feedback as usual is appreciated! 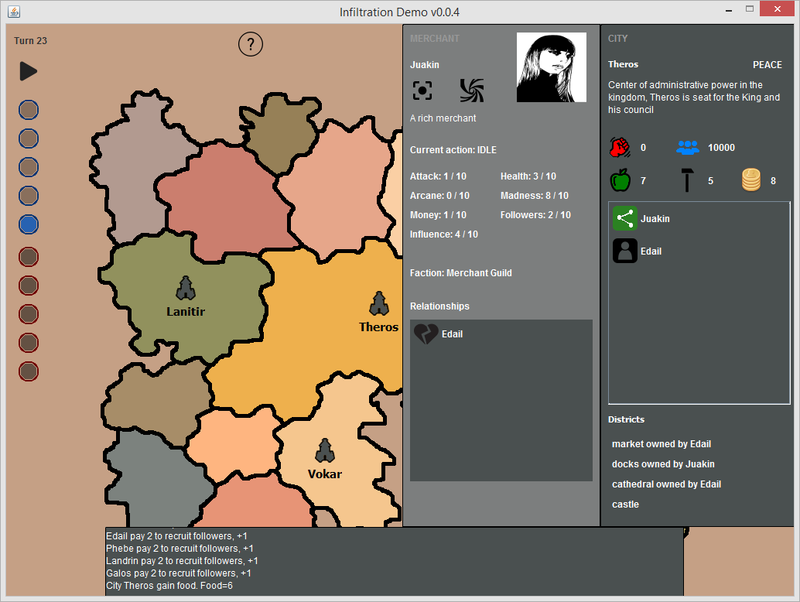 Welcome on a new update for Infiltration, an asymmetric evil god simulator (prototype so far!). In this release I have solved some problems reported on running the game, more specifically on windows. This time there is an executable (.exe file) for windows and a .jar file for linux or mac. I have also included all resources inside the archive, so any problem related to not able to load external resources will be solved! I have to say thanks to Rowan for his support on enhance game's text fixing typos and more in general grammar. I'm sure with his evocative words now game could be even more interesting and fun! Thanks! hope you find it interesting, let me know! I've noticed that the game seems to pause whenever an event happens. This gets quite annoying when you have a city in rebellion, which causes that city to have an event every turn. This game seems like it could be quite fun when it is finished. It has an interesting concept and a unique gameplay style. Thanks! It's very important for me to get feedback ! ​Welcome back for a new release of Infiltration an ancient evil prototype! 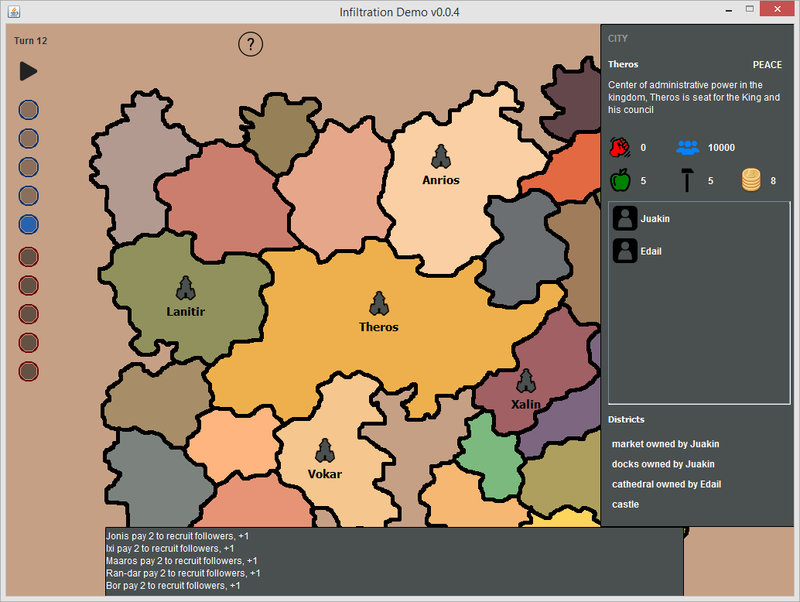 In this version I've worked on many feedback I've been received on version 0.0.4 and 0.0.5 and improved user interface. near every city, so you get quickly the idea where you have already corrupted agents and where not. without lose everything in the "main log" on bottom part of the interface. NPC actions (investigate for example). then send them in active search of hidden knowledge, using calling action. This action is really powerful, but after is completed, you will gather information on where the secret is located. If you are lucky, could be the same district that belong to your puppet, but if you are not lucky.. you have to decide. It's better to send my puppet against the mortal that own the district, or focus and then calling again the mortal? I believe that this little change is a radical change in how player will play the game and a fundamental stone on how player can manipulate mortals in following his plan. There is a way to exit from a game and go back to menu from ingame? Infiltration 0.0.8 "roads and trips"
Welcome back on this Ancient evil prototype, Infiltration! Infiltration 0.0.9 "Go down that road" is out ! This release is marked 1.0.0 because is my launch as "final prototype" of my game vision. You can find it incomplete, you can find it horrible, but I have made this prototype on my free time with a single goal: learn. I have learned a lot and I will share some toughts on my path on some next dev logp, for now, let's focus on this release! As always I'm open for comments, ideas. Even if this is a prototype any thoughts is appreciated, see you soon!